It could be months, if not years, before southeast Texans receive federal funds to pay for the long-term rebuilding and recovery of homes and communities battered by Hurricane Harvey’s epic rains, officials told legislators Monday. HOUSTON — It could be months, if not years, before southeast Texans and scores of counties and cities receive federal funds to pay for the long-term rebuilding and recovery of homes and communities battered by Hurricane Harvey’s epic rains. That panel and the House Appropriations Committee met simultaneously Monday on the University of Houston campus to discuss local, state and federal responses to the worst rainfall event in U.S. history. Some officials and experts said they are already starting to worry that countless Texans will lose personal wealth they’d accumulated, slide deeper into poverty or become homeless. “We may have a new crisis on our hands,” said State Rep. Diego Bernal, D-San Antonio. People affected by disasters may receive HUD disaster relief funds, which are distributed as grants from various government agencies and non-profits. Before the government agencies can disperse the money, they must develop an action plan that HUD approves. The public must also have a chance to comment on the plan, a process that can take 30 to 60 days. Texas officials have asked that time period be reduced to seven days. Some southeast Texas officials say they want the HUD funds to come directly to cities and counties, not flow through the state land office and metropolitan planning groups before getting to local governments. Dickinson Mayor Julie Masters, whose town of about 20,000 is southeast of Houston, fears the region’s biggest metropolitan planning organization will send the bulk of funds to larger urban areas like Houston and Harris County. “And then we all get a crumb at best,” she said of the scores of smaller communities also devastated by flooding that have gotten much less media attention. Harris County Judge Ed Emmett echoed Turner’s comments. “Fewer hands that touch the money, the better,” he said. “Direct allocations are better." The reaction from local officials foreshadowed how determining the amount of money various cities and counties receive could become a political minefield. “This is going to be a sensitive issue, to be very candid with you,” Bush told lawmakers Monday. Bush said as officials await HUD’s decisions on allocations and accompanying stipulations, his office is working with several Texas universities collecting data on the extent of storm and flood damage so they will already have a good idea about overall needs. Meanwhile, some local officials and advocates told lawmakers they’re worried about the long-term impact of the storm on vulnerable Texans. Baytown Mayor Stephen DonCarlos said many residents in his town of about 75,000 aren’t poor enough to qualify for some federal aid programs, but aren’t wealthy enough to make mortgage payments on damaged houses while paying rent for temporary housing. “We are anticipating there is going to be a significant rise in foreclosures,” he said. Marilyn Brown, president and CEO of Houston’s Coalition for the Homeless, told lawmakers that it could be weeks or months before it becomes clear how many low-income renters now meet some federal definitions of homeless. She said the most vulnerable are people who were living paycheck to paycheck and lost their vehicles to flooding, missed work in the immediate aftermath or now must find apartments in a market inundated with new renters. 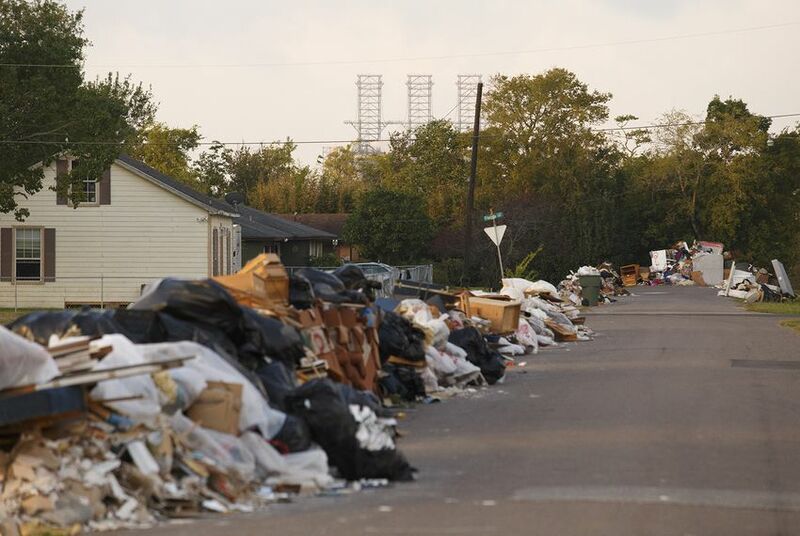 “Thousands of Houstonians are in this precarious situation,” she said. Texas Education Commissioner Mike Morath spent more than an hour taking the Appropriations Committee through a long list of costs the state might have to consider to get schools back on track. School districts across the state are taking in students who have been displaced from their homes and are enrolling away from their home districts. “We have a lot of newly homeless students in the state of Texas,” Morath said. The Texas Education Agency plans to shift about $380 million from the second fiscal year of the biennium to compensate districts for their sudden increases in enrollment. The Corpus Christi area has seen the most displacement, hosting the only three school districts still closed, set to open in October, he said. The state agency plans to spend an estimated $250 million to keep up the funding of districts with lower enrollment due to the storm — and ask the Legislature to pay for it in the 2019 legislative session. It also plans to forgive about $150 million of the increase in funds property wealthy districts affected by Harvey would be required to pay the state. Property-wealthy school districts can apply to redirect the recapture funds they would pay to the state to offset property poor districts to instead fix up their own facilities. That could cost the state a maximum of $500 million in lost funds, Morath estimated. The state is also required to pay more for students who are considered homeless and receive free or reduced price lunch over the next two years. That could cost the state $266 million. Morgan Smith and Aliyya Swaby contributed to this report.